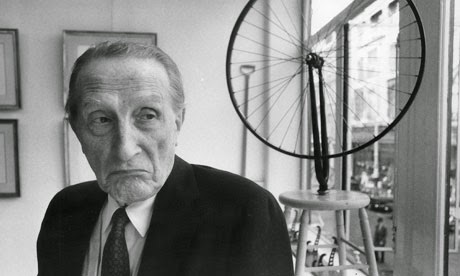 I fell and bruised my face so instead of a post post I will share with you Marcel Duchamp’s essay The Creative Act from 1957. Stay safe kids. Let us consider two important factors, the two poles of the creation of art: the artist on one hand, and on the other the spectator who later becomes the posterity. To all appearances, the artist acts like a mediumistic being who, from the labyrinth beyond time and space, seeks his way out to a clearing. If we give the attributes of a medium to the artist, we must then deny him the state of consCiousness on the esthetic plane about what he is doing or why he is doing it. All his decisions in the artistic execution of the work rest with pure intuition and cannot be translated into a self analysis, spoken or written, or even thought out. Millions of artists create; only a few thousands are discussed or accepted by the spectator and many less again are consecrated by posterity. In the last analysis, the artist may shout from all the rooftops that he is a genius; he will have to wait for the verdict of the spectator in order that his declarations take a social value and that, finally, posterity includes him in the primers of Art History. I know that this statement will not meet with the approval of many artists who refuse this mediumistic role and insist on the validity of their awareness in the creative act-yet, art history has consistently decided upon the virtues of a work of art through considerations completely divorced from the rationalized explanations of the artist. If the artist, as a human being, full of the best intentions toward himself and the whole world, plays no role at all in the judgment of his own work, how can one describe the phenomenon which prompts the spectator to react critically to the work of art? In other words how does this reaction come about? But before we go further, I want to clarify our understanding of the word "art"-to be sure, without an attempt to a definition. What I have in mind is that art may be bad, good or indifferent, but, whatever adjective is used, we must call it art, and bad art is still art in the same way as a bad emotion is still an emotion. Therefore, when I refer to "art coefficient," it will be understood that I refer not only to great art, but I am trying to describe the subjective mechanism which produces art in a raw state-d l'etat brut-bad, good or indifferent. In the creative act, the artist goes from intention to realization through a chain of totally subjective reactions. His struggle toward the realization is a series of efforts, pains, satisfactions, refusals, decisions, which also cannot and must not be fully self-conscious, at least on the esthetic plane. Consequently, in the chain of reactions accompanying the creative act, a link is missing. This gap which represents the inability of the artist to express fully his intention; this difference between what he intended to realize and did realize, is the personal "art coefficient" contained in the work. In other words, the personal "art coefficient" is like an arithmetical relation between the unexpressed but intended and the unintentionally expressed. To avoid a misunderstanding, we must remember that this "art coefficient" is a personal expression of art "d /'etat brut," that is, still in a raw state, which must be "refined" as pure sugar from molasses, by the spectator; the digit of this coefficient has no beadng whatsoever on his verdict. The creative act takes another aspect when the spectator experiences the phenomenon of transmutation; through the change from inert matter into a work of art, an actual transubstantiation has taken place, and the role of the spectator is to determine the weight of the work on the esthetic scale. All in all, the creative act is not performed by the artist alone; the spectator brings the work in contact with the external world by deciphering and interpreting its inner qualifications and thus adds his contribution to the creative act. This becomes even more obvious when posterity gives its final verdict and sometimes rehabilitates forgotten artists.